Join the Scopus team at ALA-Midwinter this upcoming Sunday for a special panel on "New Possibilities in Evaluation Metrics: Authors + Altmetrics = ?". The panel will take place in Elsevier booth #1207 on January 26 at 3:00 PM. Since Scopus launched 10 years ago, publishers, institutions, librarians, and researchers have become enmeshed in a radical reinvention of the means by which authors and readers interact with and evaluate one another. The means of measurement, identification, collaboration and analysis of researchers have all converged into a mash-up of previously disparate lexicons. This panel brings together speakers whose work explores the intersection of new author-centric standards like ORCID with the fast growing altmetrics movement. Moderator Michael Habib, Senior Product Manager, Scopus, will challenge the panelists to address how new standards for author identification complement and support the altmetrics movement. As the Scopus release on February 1 is quickly approaching, we would like to share more detailed information about the release and what major enhancements you will see. With this release, we have enhanced the core search experience by updating the Scopus user interface with theprimary goal to streamline the number of steps a researcher needs to take to accomplish the most common tasks. You can find the Release Notes here: Scopus Release Notes 2014.1. For questions or to provide us with feedback, please email Scopus Product Marketing. We will try to answer all questions directly or via public forums such as the Scopus blog posts or in future . With the upcoming release on February 1, we would like to share some information on the major enhancements that will affect the design of the Author and Affiliation pages. The purpose of these changes is to create a better overview of the performance of a certain Author or Institute. The Author profile will get a ‘CV-style’ design that allows for easier scanning of the main column that includes information such as h-index, documents and citations. It will show the 20 most recent documents instead of the two that are currently in view. 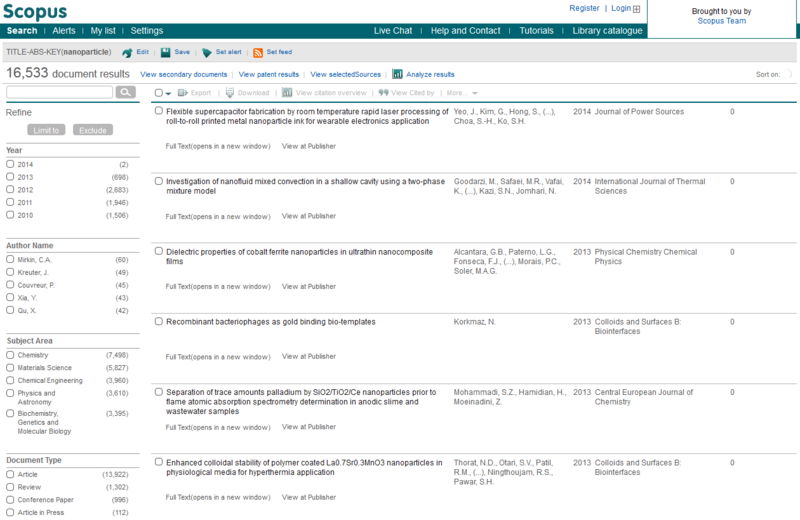 More documents will also show on the free Author profile version that researchers can view without having access to Scopus. There will be a prominent ‘Follow this Author’ link that will help authors become more visible to their peers; this feature allows users to set up alerts for a when new documents are indexed for a specific author. In our efforts to continuously improve the Scopus user experience, we plan to make important enhancements to the Scopus user interface in early February 2014. These product enhancements focus on streamlining the researcher workflow by optimizing the interface for core use cases. Over the next few weeks we will blog on specific changes as well as direct you to training materials. One important change is that the user interface becomes more action driven; as a user selects certain results to work with (e.g. for refinement, citation analysis or to export references), the action buttons or links will become “active” and make the experience more intuitive. Another important change is that results page will be optimized for easier scanning of the search results. Below, you can view a screen shot of how the results page will look in the new interface. You can share your feedback via our Scopus Marketing email address.